This summer, BioDay returns to showcase the biodiversity of TU Delft. BioDay is open to the whole TU Delft community, from students to principal investigators and from business relations to lab technicians. Come to share and hear about new and exciting science, socialize with students and researchers from all faculties, inspire, be inspired, cross-fertilize and plant the seeds of the next generation of world-leading biology-related research at TU Delft. 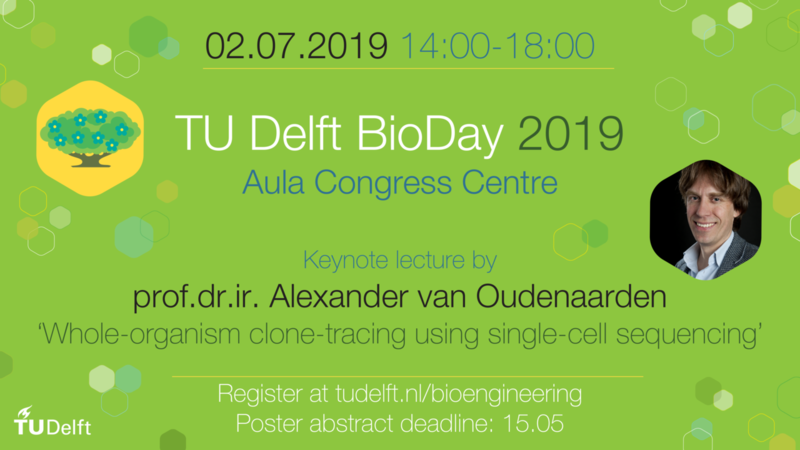 On Tuesday 2 July 2019 the BioDay afternoon will kick off with a keynote lecture on whole-organism clone-tracing using single-cell sequencing by TU Delft alumnus prof.dr.ir. Alexander van Oudenaarden, director of Hubrecht Institute-KNAW.This lecture will be followed by five poster pitches and three BioDate 2018 project presentations. We will conclude the day with a poster presentation session (including poster prizes) in the Aula Foyer. We welcome all biology related research posters, please submit your poster abstract before 15 May 2019.